The agritourism Il Giglio, is just a few kilometers from Magliano Sabina. 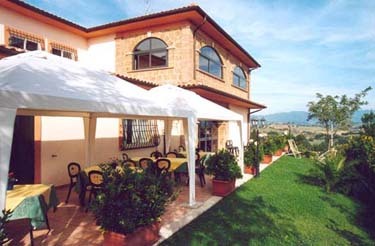 It is completely surrounded by a magnificent panorama and from the house there is a magnificent view of the Tiber valley below. In such a splendid natural setting, as the predominantly amen region of the Sabina, the agritourism “Il Giglio” means staying in a country, but deluxe house with all the imaginable comforts, it means eating home-cooked food, and the products of the land - from oil of Sabina’s olives to wine, to vegetables, eggs and meat too. Our aim is to offer a relaxing holiday in an exclusive environment for a limited numbers of guests, so that we may provide personal attention, privacy and tranquility. The guests are here received with enthusiasm and in the warm and quiet atmosphere of this house. To spend some days at the agritourism “Il Giglio” is a good way of getting to know the place and its people. The agritourism Il Giglio is only few minutes by car from the Umbrian region, and other historic and artistic towns which are easily reachable. The agritourism, in fact, is also a convenient base from which to visit Rome, Narni, Orvieto, Spoleto, Cascata delle Marmore (Marmore Falls), and many other interesting places suitable as day-trips. Guests are recommended the best ways and places where to spend an unforgettable holiday in Italy.